Poets, Story Tellers And Fellow Travellers! I love a walk in the park especially when I come across that pretty little tiny flower hidden under a leaf. You know the ones that are so easily missed? I love to catch a glimpse of squirrels playing in the trees, or birds flitting from tree branch to tree branch. And then I love sharing those hidden treasure with you. You might say it's my passion. I could fill a library with my stories and pictures. But now I would like to hear your stories. What's your passion? Now it's your turn to tell your tales and share your pictures. How about it? Do you have a story to tell? The most popular section of Nature And Flower Pictures is Pictures of Lilies. I often get tips and questions from readers. Recently I have been receiving some beautiful pictures and the stories to match. Kenric from Connecticut shares his Pink Sacred Water Lily and how he made a special trip to capture it in the best light. And more recently I got a note from Larissa in New Zealand who wanted to share Pictures From Her Garden and an interesting purple lily called Snakes Tongue. Check it out and you'll see why it was given this name. Kenric also shared with me a beautiful Allium Lucy Ball and how he loves taking pictures while on vacations around different areas of the US. I hope he will continue to share those lovely shots with us. Don't you? Just like this beautiful Southern Magnolia Flower he took while visiting the Norfolk, VA Botanical Gardens. One of my favorite contributions comes from a light in my own heart. My granddaughter Jessica shares a few Photos of Roses that she took at the age of eleven. Maybe I could convince her to share how she got such an eye for beauty. She is a natural. Don't take my word for it, see for yourself. But I couldn't call the site Nature And Flower Pictures if I didn't tell you about some of the awesome stories and poems sent in by other readers. Take for example this cute little story with photos sent in all the way from Norway. Sharleen tells us about hedgehogs in a way that I never could, especially since I have never seen one. Read her Little Hedgey Buddy story and you'll see what I mean. These guys are a cross between a porcupine and a possum. She doesn't stop there though. She shares some beautiful scenes of Norway that make you want to schedule the next flight over to this lovely country. What respectable site would leave off those elusive butterflies? When I first started this site I could never seem to capture a butterfly with my camera. When I had nearly lost all hope I received a gift from my sister who was living in Virginia at the time. Dodie graciously shared with me these Yellow Swallowtail Butterflies that she captured in her Zenia flower bed. And I was really excited when Darlene from WV sent in this Luna Moth Picture she captured on her early morning walk. Another popular section is Bird Pictures and who doesn't love baby birds. Stephanie from WV spent a good part of her summer following a nest of Baby Robins till they flew the coop. And Michelle, Stephanie's daughter did the same with a nest of Baby House Wrens from egg to filling the nest that she found in the corner of her garage. You've heard the saying that a picture is worth a thousand words? Well Sharleen from Norway tells that story very well in her Magpies And The Bread Story. Sharleen is also quite the poet as she shares a poem with us here, Magpies Poem And Pictures. Now you can see why I am so excited about this new feature. So what do you say? Do you have a passion or story you would like to share? I invite you to tell me your Nature Tales and I will create a page just for you. Or maybe you have a special question or tip you'd like to share about digital photography? Come on, you know you want to. This months image goes along with the season. We have had some beautiful snow this winter. And I thought I would celebrate by sharing this winter scene with you. 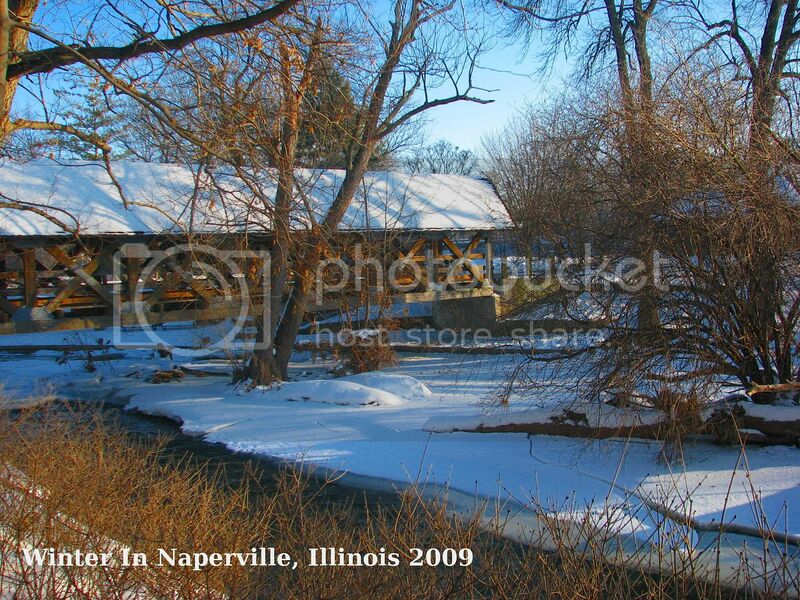 The photograph was taken at the Naperville, Riverwalk in Naperville, Illinois. I like walking in this park in the winter because they keep the walks clean. It can get quite challenging walking in the Forest Preserves when the snow is deep and the temperatures are frigid. But the pictures are fun to look at, huh?